Breakfasts are wonderful at our house. Although, to be perfectly honest, during the week we just find our own simple breakfasts, but on Saturday, all bets are off. We’ll have pancakes, waffles, scrambled eggs, sausage or omelets. Omelets make a wonderful meal – breakfast or dinner. Add any ingredients you have on hand for omelet fillings – onions, peppers, zucchini, tomatoes, basil, cheese, ham and bacon are all wonderful fillings. 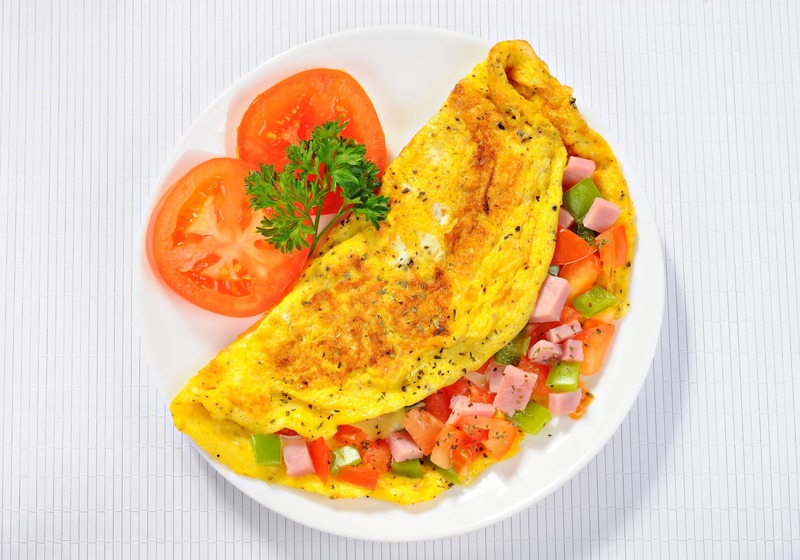 Enjoy this delightful ham and veggie omelet for a filling and delicious breakfast. A wonderful omelet with fresh vegetables and ham. A delicious and simple Weight Watchers breakfast idea. Lightly coat the skillet with cooking spray. Beat the eggs in a bowl and season with salt and pepper. Gently pour 1/2 of the eggs into the skillet. Reduce heat to low and cook until the eggs begin to set up. Add the 1/2 of the vegetables and ham to the omelet. Continue cooking until the eggs are set up. Flip the omelet in half.